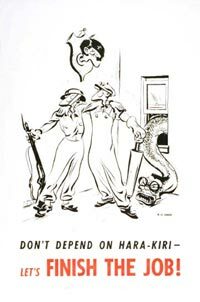 This 1945 propaganda poster uses humour and negative racial stereotypes to encourage Canadians to pursue the war against Japan. Hitler, caricatured as a mounted hunting trophy, is no longer a threat, but Canadians must remain vigilant to defeat Japan. Expecting the Japanese to practice "Hara-kiri," or ritual suicide, as an alternative to surrender, will be insufficient to ensure victory. The design exaggerates Western stereotypes of Japanese physical features, including the eyes, the teeth, and the hair. It also presents the Japanese Emperor Hirohito as a serpent, a creature that implies not only cowardice and sneakiness but also, in the Judeo-Christian tradition of most contemporary Canadian viewers, evil.